The stele of Naram-Sin is one of my favorite works to discuss with my ancient art students. This stele was created to commemorate Naram-Sin’s victory over the Lullabi people of the Zagros Mountains. I’ve already written a little bit about the two inscriptions on this stele. My students and I discuss these inscriptions and their implications quite a bit, but I also sometimes get pinpointed questions about details of this stele that I previously hadn’t considered. During two different quarters, I have had students ask me about what specific types of trees appear on the mountain. 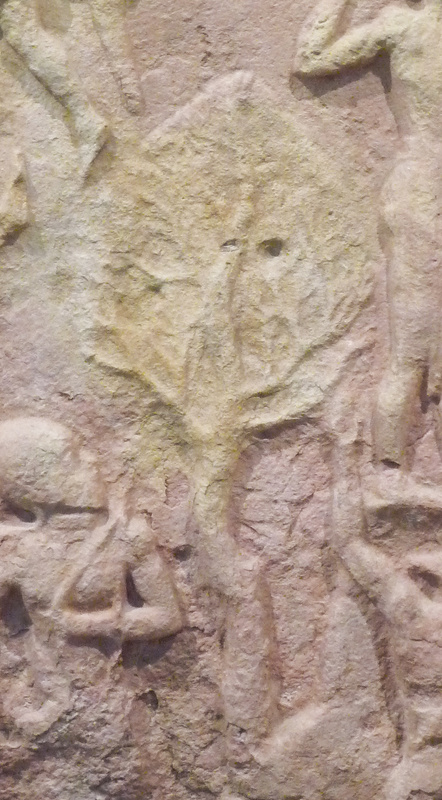 (This question is usually prompted because Stokstad’s Art History textbook mentions that the stele includes identifiable trees which are native to the region.1) If you look closely at the rest of the stele that exists today, there are two trees stacked vertically on top of each other. After some research, I was able to report to my students that one scholar, Irene J. Winter, has pinpointed the type of tree depicted on the stele. She finds that this specific type of oak tree, called the Q. aegilops, is prominent in the area where the military campaign of Naram-Sin took place.2 In other words, the trees might help to serve as visual evidence for the accuracy and actuality of the event that took place. The limestone itself may also have been taken from the Lullabi campaign region, as a further visual manifestation of the accuracy of the stele and the site-specific conquest which took place.3 If you are curious, you can read a .PDF of Winter’s article (with specific details about tree and limestone on ps. 69 -71). 1 Marilyn Stokstad and Michael W. Cothren, Art History, 4th edition (Upper Saddle River, New Jersey: Prentice Hall, 2011), 27. 2 Irene J. Winter, “Tree(s) on the Mountain: Landscape and Territory on the Victory Stele of Naram-Sîn of Agade,” in Landscapes: Territories, Frontiers and Horizons in the Ancient Near East Part 1, edited by L. Milano (Padova: Sargon, 1999): 69.